Over 205 billion emails are sent everyday and the majority of these come from the business world, so it is no wonder that important correspondence often gets lost in high traffic inboxes. 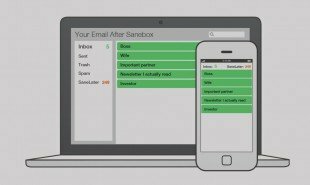 Now, from SaneBox — an inbox organizer that works with any email provider — SaneNoReplies is a new feature that automatically places any unanswered outgoing messages in one folder, enabling users to instantly locate all emails that they need to follow up. To begin, users subscribe to SaneBox, setting it up on their existing email account. Then the system uses advanced algorithms to filter incoming emails, siphoning off unimportant messages to the SaneLater folder and leaving only the important emails in the inbox. The SaneNoReplies folder is an additional feature that offers an instant view of all of the sent emails that are awaiting a reply. SaneNoReplies is one of a growing range of products that can help users separate the digital wheat from the digital chaff. The recent Innovation Culture Bulletin outlined numerous tools that can help people maximize their productivity by eliminating distractions. How else could filters help people prioritize their most important digital communications? The post Email filter system cleans up any inbox appeared first on Springwise.